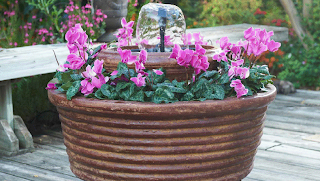 For any back yard enthusiast to create a calming oasis a water feature is perfect. 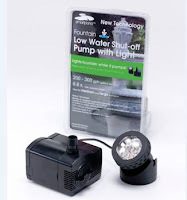 When I had the chance to host a giveaway for a fountain pump I was excited to be sharing such a cool one like this SmartPond Low Water Shut Off and Light. The "smart pump" technology allows the pump to shut-off when the water level becomes too low and automatically resumes pumping when water is refilled to the appropriate level. Different from standard pond pumps since it creates aeration and movement so bugs like mosquitoes are not attracted to it. 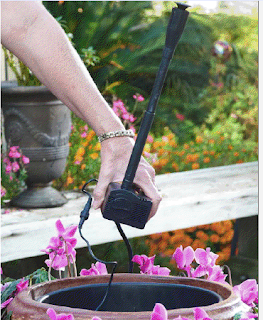 This SmartPond pump is available exclusively at Lowe's stores. The site has a helpful section called The Smart Approach to help you build an in-ground pond with specs and even a video. 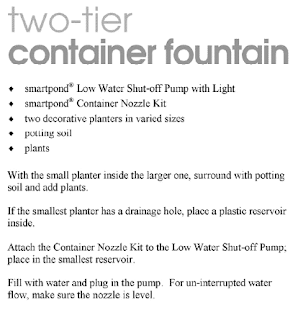 Here is a fountain project for a two tiered fountain using the pump you can win here. What is your favorite item in your yard or garden? *Limited to US residents; 18 years old and above. Giveaway starts July 6, 2011 and ends on July 21, 2011 at midnight PST. Winner will be emailed and has 48 hours to respond before another winner is selected. I was not paid for this giveaway or post. The opinions on this item are 100% mine and may vary from others. I love my orange tree! Well, It would have to be my grill! lol I don't have a garden, but I will next year and this would be fantastic to have! I like our Blueberry bushes. I have a cactus garden that I love! i would LOVE to have the Pond Skins® EPDM Pond Liner. I like my tomato plants best, the birds like the bird bath best, it is HOT here. I like the-Floating Pond Planter. My solar multi-colored butterfly lights! I'd love the floating pond planter! 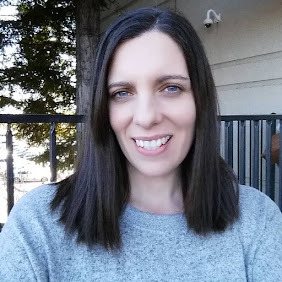 I like your new page on FB! I have a large half-barrel on my patio that is the focal point of the area. I love trying new plants and flowers in it every year! My favorite item in my garden are my pink lillies. 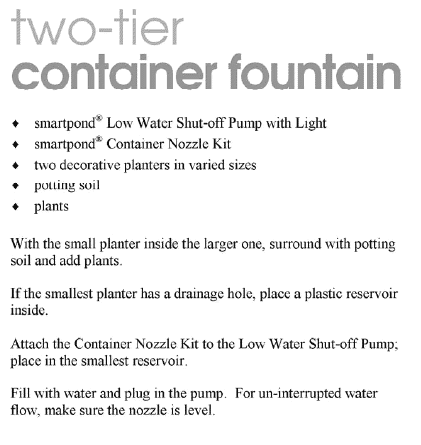 I also like the Container Fountain Kit.